Last week Stan and I headed to the beach for a few days and it was a scorcher! I brought skincare products with me that were designed to replenish, soothe and HYDRATE HYDRATE HYDRATE! I figured I would show you the products I brought and my thoughts on each. At the bottom of the post, I linked all the makeup products I brought with me and I'll be doing a video soon on my beach makeup look. 1. Shu Uemura Anti- Shine Fresh Cleansing Oil - I cannot believe this is the first time I am reviewing a Shu Uemura Cleansing Oil on the blog. These cleansing oils were the first ones to turn me on to oils in general, and they transformed my skin years ago. I brought it with me on this trip because it is the most effective oil at removing every last stitch of makeup, sunscreen, etc from my face and feels like liquid silk on the skin. It dissolves easier than almost any other oil I have in my collection and leaves my skin feeling so hydrated. 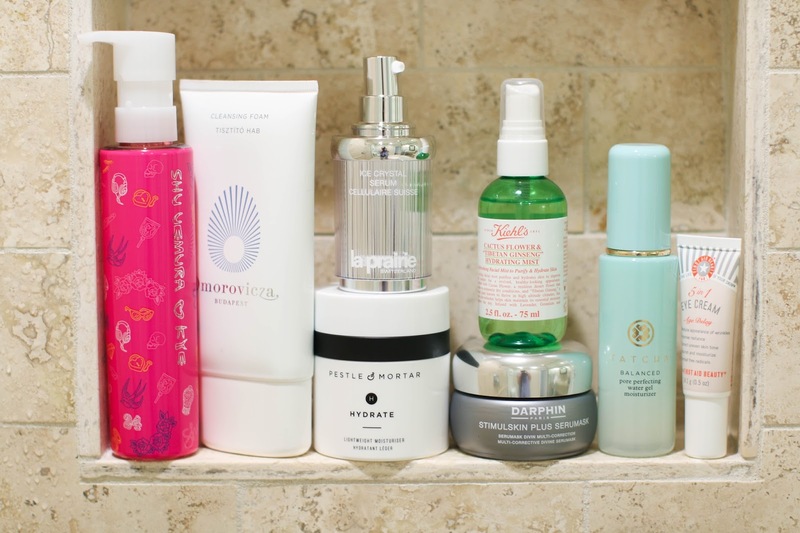 It gives my skin such a great deep clean that if I wanted to skip a second cleanse, I could. 2. Omorovicza Cleansing Foam - I am pretty vocal about not loving a foaming cleanser, but there are those few exceptions (this being one of my favorites). Thankfully this Omorovicza falls into the exception category. It foams but not with tons of bubbles and still leaves my skin feeling soft and supple rather than tight and dry. I brought it with me because it worked wonders as a second cleanse and then also as a morning cleanse. 3. La Prairie Ice Crystal Serum - If you scroll down a few pictures, you can see that this serum has a bit of shimmer in it that helps to give the skin a gorgeous radiance. However, I prefer using this in the evening as a way to help calm, soothe and hydrate my skin. When at the beach, I needed products that were designed to help replenish after spending most of the day in the sun. This serum, while it has anti-aging benefits is also amazing at giving my skin back the moisture that it has lost, helping with any inflammation while instantly smoothing the skin. But not only does this serum work wonders, the entire Ice Crystal line is quite a transformative range. I swear by this for a sunscreen/foundation hybrid and my mother and I both love this oil as a decadent treatment especially during the winter months. 4. 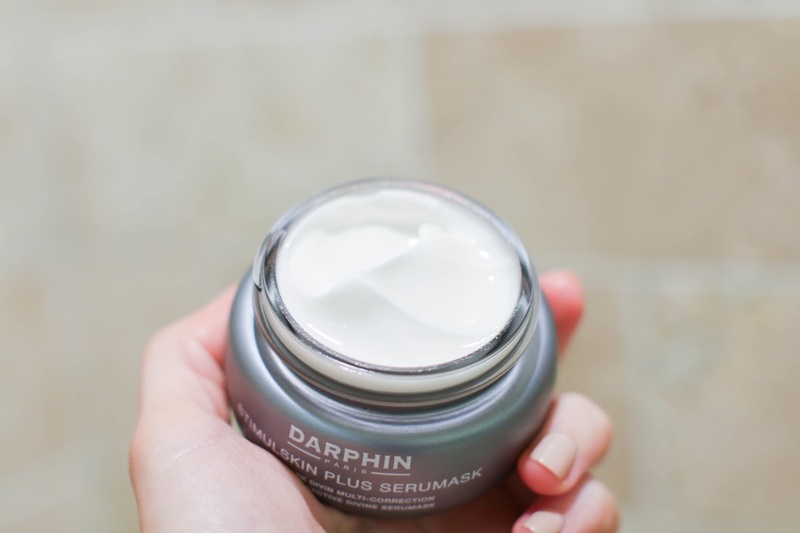 Darphin Stimulskin Plus Serumask - I knew I needed a mask to give me a strong boost of moisture at night after being in the sun all day, so I grabbed this Darphin serum/mask to bring with me. It's thick, rich and instantly cooling on the skin and I tissue it off leaving a thin layer to press on to the skin. My skin feels plump, firm and moisturized immediately after. It works instantly so I leave it on for 10 minutes, tissue off and press in the remaining product into my skin. For dinner, I just went ahead and applied my makeup right on top of this, but during my nighttime routine I like to finish with a serum and lightweight moisturizer. 5. 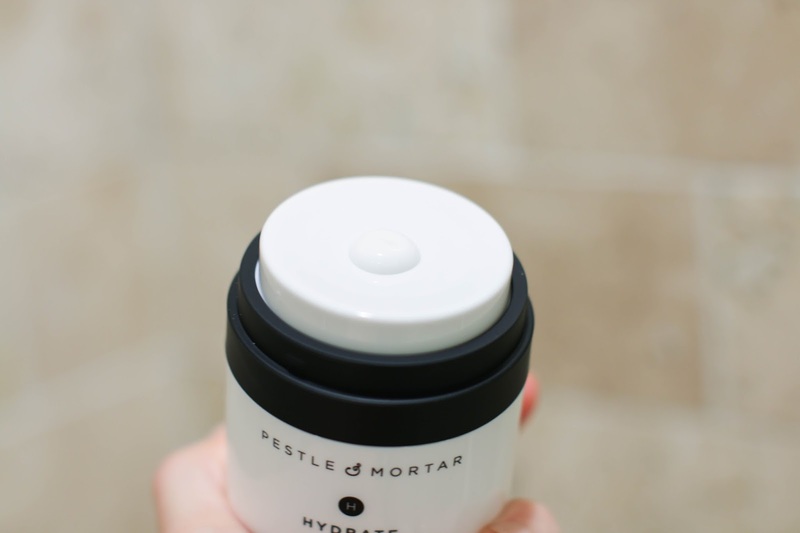 Pestle & Mortar Hydrate Moisturizer - I love this moisturizer because it's lightweight, comfortable and easy. It's not designed to do much more than hydrate the skin, but that is what I love about it. The texture is perfect for the hot weather because it helps to add back in a bit of moisture, but doesn't make my skin feel like it's being suffocated. 6. 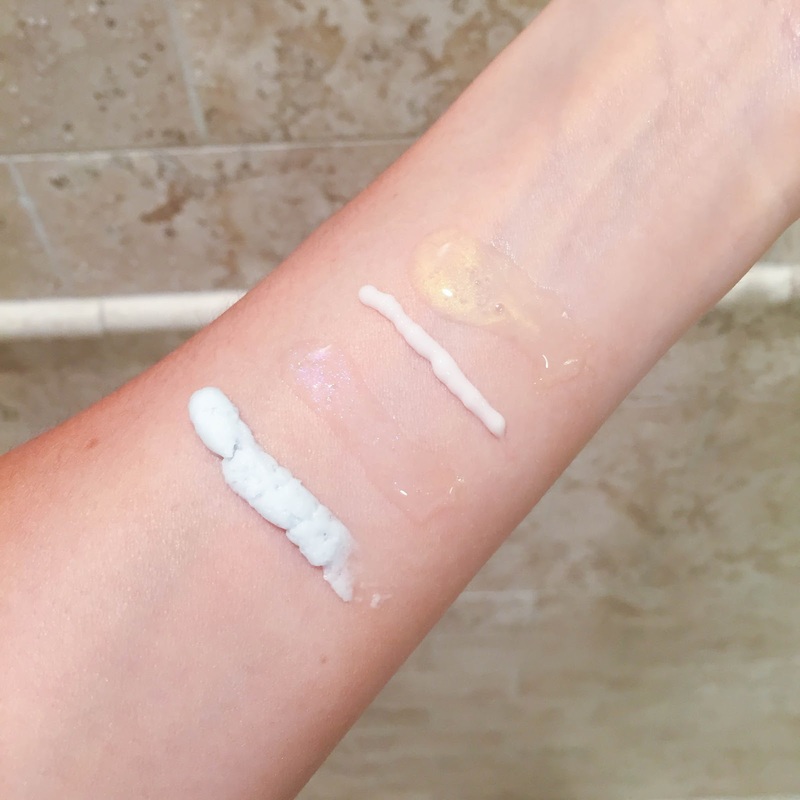 Tatcha Pore Perfecting Water Gel - During the day, I wanted something to moisturize my skin under my sunscreen but the heat and humidity were no joke so the texture of the product had to be bearable. This Tatcha Water Gel was absolutely PERFECT! It feels like a bit of nothing on the skin but instantly helps hydrate without making me additionally shiny or oily. The gel itself does have a bit of shimmer to it, but is undetectable on the skin. This has become a summer staple for me after using it these past few weeks. 7. First Aid Beauty 5 in 1 Eye Cream - To be honest, I saw this on my shelf and threw it in my bag having never tried it before. I didn't expect much (though I really do love FAB products - these pads are an acne fighting favorite, this is a moisturizer and hand cream staple), but as soon as I applied this under my eye - wow! The only word I can use to describe the texture and feeling was comfort. It felt rich yet not thick, and comforting yet not the least bit greasy. It worked wonders on my eyes each morning to help depuff and soothe them, and at night it was a welcome relief after being in the sun all day. 8. Kiehl's Cactus Flower Hydrating Mist - Mist, mist and more mist. That is my motto at the beach. I would use this refreshing mist during my skincare routine and then I threw it in my bag to bring with me during the day. Whether at the beach or grabbing something to eat, I would give my skin a quick spritz to help cool it down and replenish a bit of moisture. It smells fresh like a fruity cactus which made spraying it so much more pleasurable! In addition to the products photographed above, I never travel without this cream which is in case I have a breakout and of course I needed to bring a sunscreen (this one for high SPF and this one for mattifying the skin).